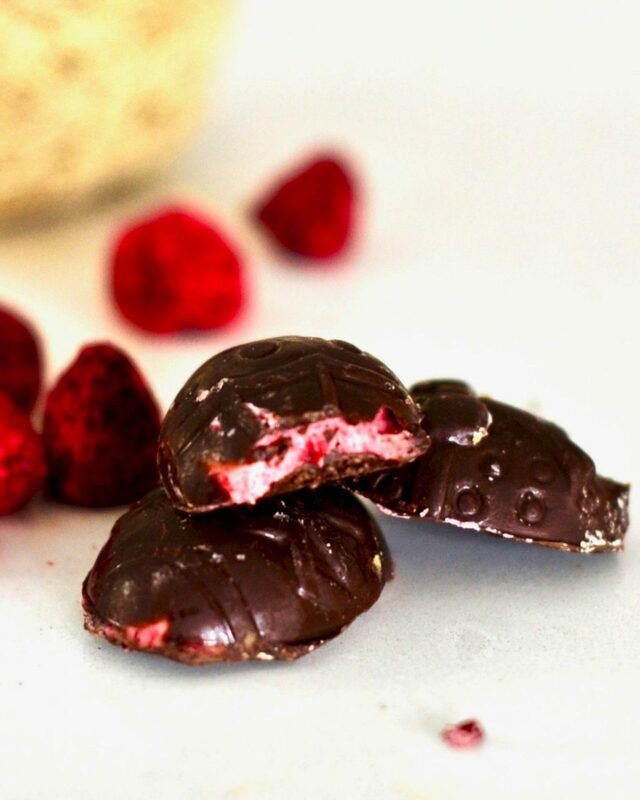 Crisp chocolate shells filled with pink tinted Coconut Raspberry cream. Each tangy fruity bite is sweetened with a drop of amber maple syrup. When my kids first became vegan they worried that our traditional Easter nests would suffer from a lack of chocolate. No need to worry vegan Easter is just as full of candy and treats just with ahem a smidgen more compassion and a lot less guilt. Each spring as Easter approached I wove for them large nests from twigs, long dried grass, moss and just about anything I could find in the garden that had survived winter’s destruction. 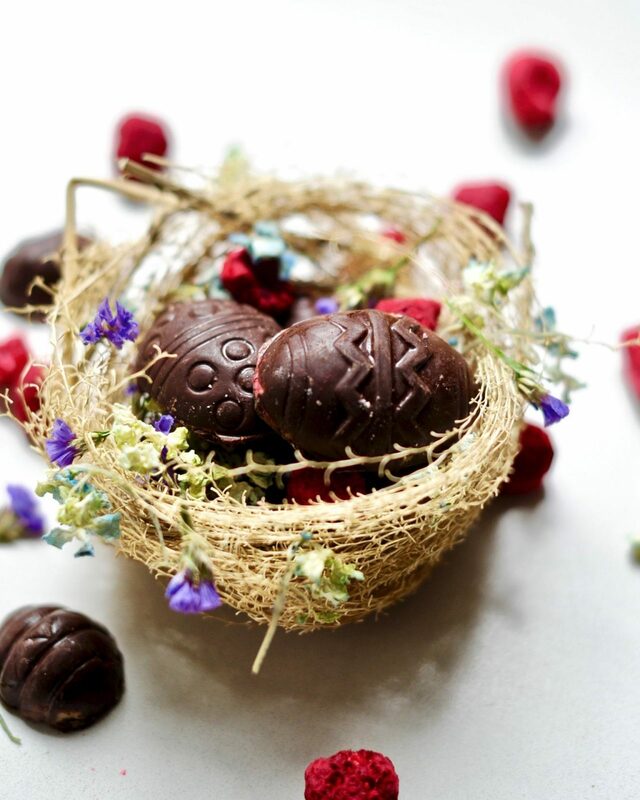 Into these nests I placed a plethora of home made vegan chocolates and tiny treats like Pokemon cards for my son and bright scarves for my daughter. This year you can make your own vegan Easter treats as well. Amazon has a ton of inexpensive Egg Molds. I bought mine for $5 about seven years ago and it is still going strong. They even have an Easter Basket with everything you might need for a sweetly dairy-free Easter. Wow, have times changed! The things that brought me the most comfort now were too small to list. Raspberries in cream. Sparrows with cocked heads. Shadows of bare limbs making for sidewalk filigrees. Roses past their prime with their petals loose about them. Once when driving onto the highway in Israel my mother-in-law’s beloved golden retriever, Bumber came into view. That dog loved our two year old daughter Livy passionately from the tips of his paws to the tips of his floppy ears. He was kind of obsessed with her, and she with him. He had chased us the three kilometers from the Kibbutz across muddy fields and ditches to reach us at the junction. Understand it was a rental car and it was the rainy season and said dog (Bumber) was more mud-dog at this point then golden retriever. I made that grunting grown-up sound that we adults make when about to acquiesce to fate. I sighed as we slowed the car and exclaimed at the mess Bumber would make when we took him into the car. Bumber clambered into the back seat of the car and snuggled up to Livy’s booster seat. She smoothed his bramble coated haunches and lay her head upon his. heck out my Aquafaba page! For tips, tricks and to see all of my Aquafabulous recipes. 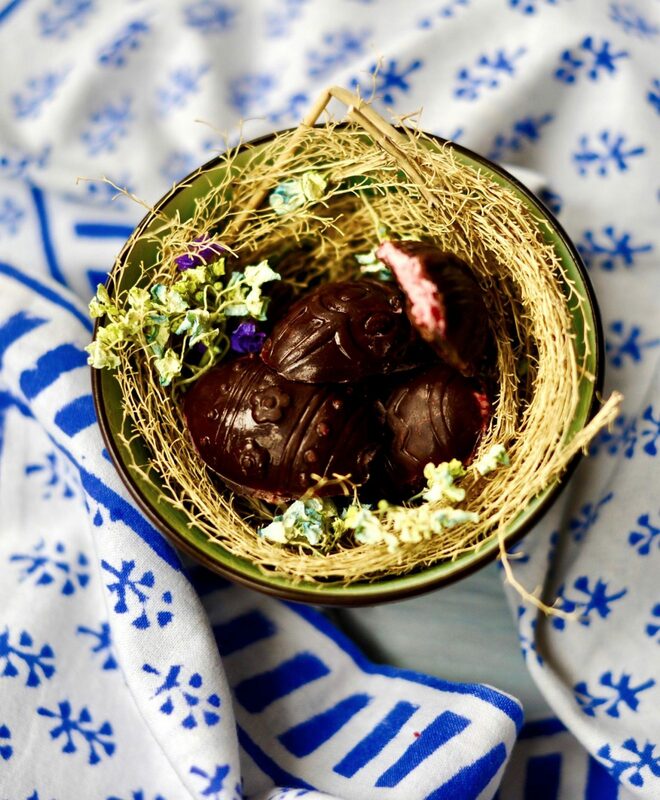 Raspberry cream filled dark chocolate Easter eggs that take twenty minutes to make. Yes!!! You can flavor them with any freeze dried fruit you have on hand. Ommmm nommm. Melt your chocolate. Lately I've been using the microwave but a double boiler works great as well. Remember not to get any water in your melting chocolate or it will seize. I obviously used molds. Amazon has many inexpensive plastic molds and they are so much fun to play with in the kitchen. I've placed a link to these the molds I've used above the recipe but this recipe works wonderfully made in mini cupcake liners as well. Brush a thin layer of the melted chocolate into your molds, leaving room for filling, and allow to set in the freezer while you make your raspberry filling. Mix the the freeze dried crushed raspberries and coconut shreds through the mixture with a spatula. I like for the raspberries to have some larger bits for pops of flavor and color. In a food processor blend your cashews, vanilla, maple syrup, melted coconut oil and enough of the plant milk to get a smooth paste. Remove the molds from the freezer and place a small amount of the filling into each mold. Press down with your fingers to flatten fill the mold, leaving room for a layer of chocolate at the top. Gently brush a layer or two of melted chocolate over the top to seal in the raspberry filling and place in the freezer 5 minutes to set. Pop out of the molds and wrap in foil or eat. I love the idea of using cashews! 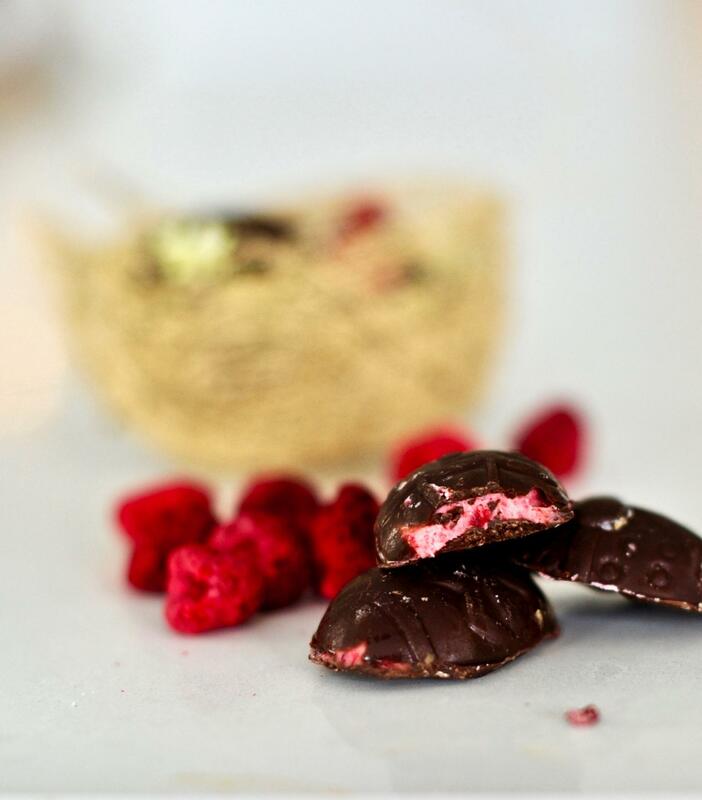 Raspberries are – next to nougat/praliné – my favourite filling for homenade chocolates,but I usually have to resort to raspberry marmelade or fresh berries, as freezedried raspberries are more difficult to get hold of (and more expensive..). And I love it when children outsmart their parents with a down-to-earth and straightforward sageness. Yes kids don’t over think like we do they just rect from the gut unlike us adults. Weaving nests from old twigs and grass in garden and filling them with cruelty-free treats: what a magical Easter tradition! Your children are so lucky to have a parent with so much imagination and compassion. Thank you babe! I look forward to doing the same for Zoe’s babies one day.